Runoff has been a problem for generations in most countries. In the Great Lakes, it is now creating enormous blooms of algae on the coasts. Enter the Quagga! It's a large mussel, Dreissena rostriformis bugensis, that emigrated from the Ukraine, bearing a superficial resemblance to the Quagga zebra. Its efficiency is such that it can filter a quart of water every day.. We must ignore that attractive appearance of the lakes. 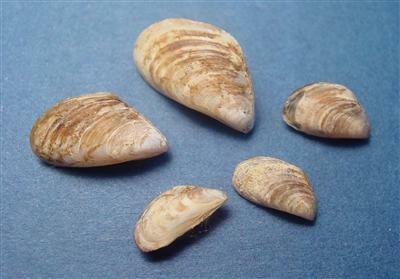 The similar zebra mussel is also involved in this Lakes disaster. It has thrived and is now quite capable of consuming all of the algae-and it does. Offshore, where fish survive to some extent, no algae is available after the mollusc's filtering. The water's appearance is sparkling, after all the filtering! The biomass of prey fish (which are fed upon by predators such as lake whitefish and salmon) in the open waters of Lake Huron has declined by 95 percent in just 15 years. The populations of the tiny freshwater shrimp, Diporeia, at the base of the Great Lakes food web have declined in Lake Michigan by 94 percent in 10 years. The shrimp has obviously failed to compete while the more important (to anglers) species higher up the chain are all starving to death. Frank Krist, who chairs the Lake Huron Citizens Fishery Advisory Committee to the Michigan Department of Natural Resources has called the report a wake-up call, but down on Lake Erie, they have figures worse than the infamous "dead lake" in the 1960s. The toxic bloom alga, Microcystis, was two feet (60 cm) deep this summer, the worst abundance ever recorded. Lake businesses are suffering badly as nobody wants to fish among the algae, and the bloom stretches out for ten miles. The toxins are well known to cause sickness and deaths have been recorded in the past. Lake Superior is the only lake to have reasonable nutrient levels inshore. · Targeting Great Lakes restoration programs to reduce nutrient pollution. Michael Murray is the co-author, along with Julie Mida Hinderer, declaring, "The challenges facing the Great Lakes are no less severe today than they were in the 1960s when Lake Erie was declared "dead." Obviously the size of the problems correlates to the size of the Great Lakes and a repeat rescue operation is unavoidable. How sad.